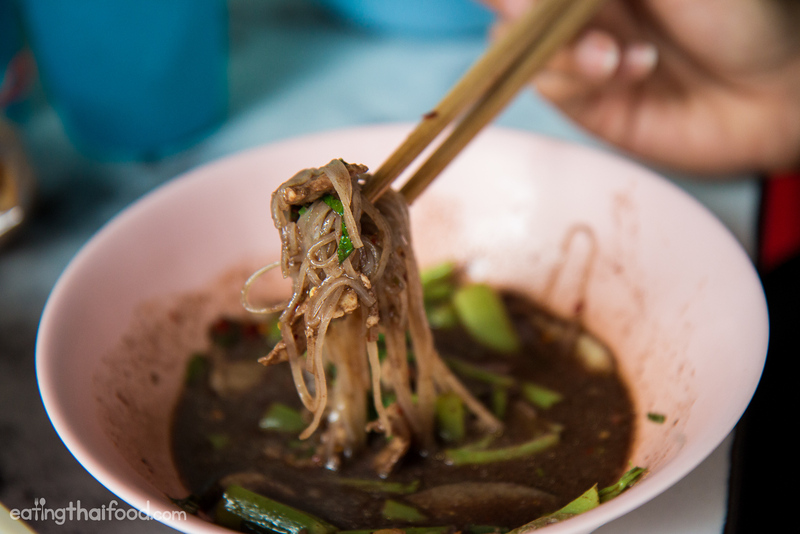 Eating boat noodles in Bangkok is an activity that provides never ending entertainment. There are so many boat noodle restaurants and street food stalls spread throughout the city, and it’s fun to try new places and compare their boat noodles. Not long ago I tried a restaurant called Kuay Teow Nai Buem (ร้านก๋วยเตี๋ยวนายเบิ้ม), and the boat noodles were pretty decent, fantastic actually. I was in the Dusit area, after having just gone to the Ananta Samakhom Throne Hall (video), and after a quick Foursquare search, I found a boat noodle restaurant to try. Boat noodles is one of those Thai noodle soup dishes I’ve enjoyed eating ever since I first came to Thailand. 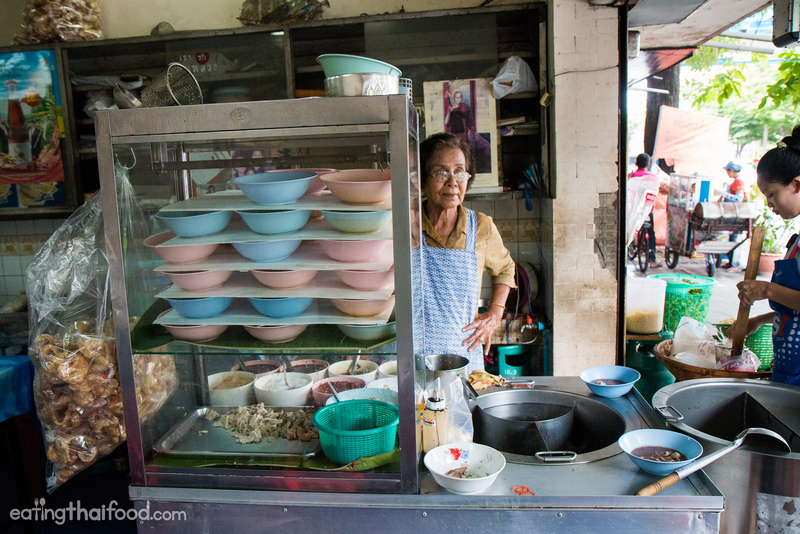 Along with Dwight and Cody, years ago we used to down bowls and bowls of boat noodles at Bangkok’s boat noodle alley and stack up the bowls on our table. For the longest time I really enjoyed eating boat noodles at Boat Noodle Alley at Victory Monument. 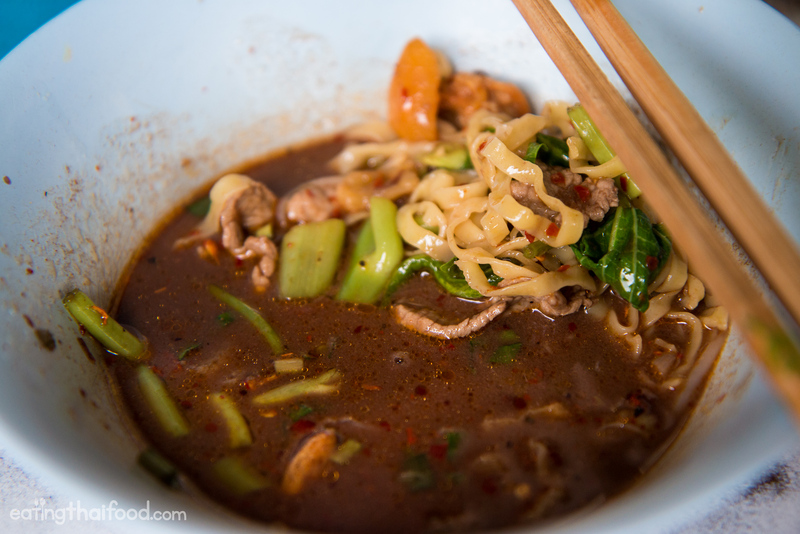 While those boat noodle restaurants are still well worth visiting for the ultimate boat noodle atmosphere experience in Bangkok, over the years I noticed the quality of their boat noodles, and the flavor, going down. 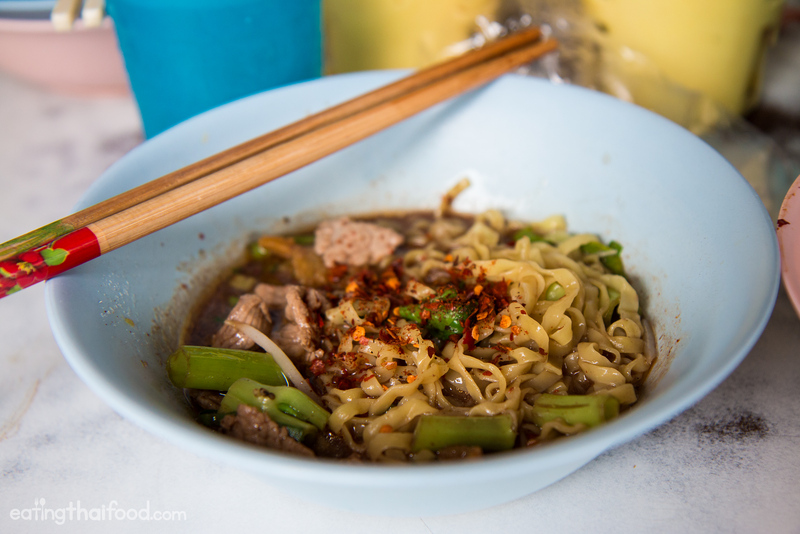 So at Victory Monument I started mostly going to Doy Kuay Teow Reua, just a 5 minute walk from Boat Noodle Alley – they still serve one of my favorite versions of boat noodles in a good environment in Bangkok. So Ying and I walked over to Kuay Teow Nai Buem (ร้านก๋วยเตี๋ยวนายเบิ้ม) to find a nice, and very small, home style boat noodle restaurant. I could smell the sweet fumes of boat noodles on the sidewalk as we approached. Whenever you go to a boat noodle restaurant in Bangkok, you have a number of different choices of what to order. At this restaurant you could either order beef (blue bowl) or pork (pink bowl), and then you could choose the type of noodles you wanted. I normally try a mixture of all the above, including sen lek (medium sized rice noodles), sen mee (thinnest rice noodles), and I also had a bowl of ba mee (egg noodles). NOTE: Just note that if you order beef boat noodles the broth is still made with pork, just the meat pieces are beef. 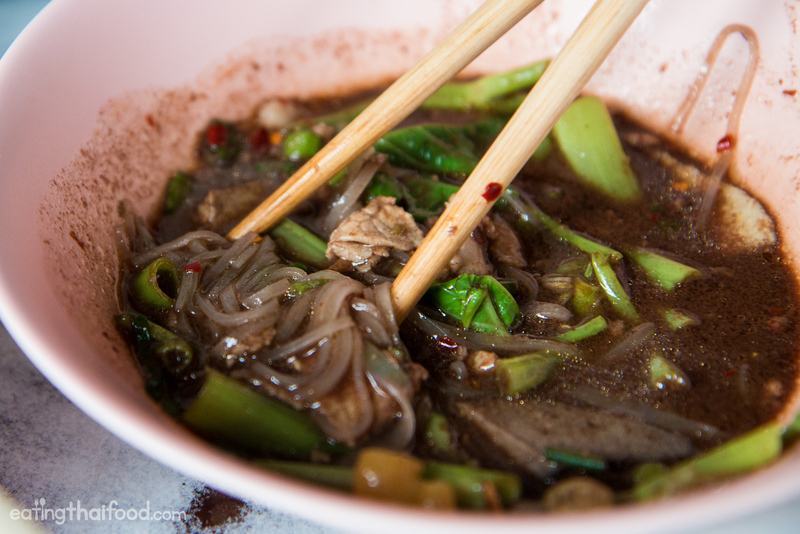 Additionally, although I think the reason to eat boat noodles is because of the addition of pork blood in the broth (that’s what gives it its rich dark color and flavor), you can order boat noodles without the blood in the broth (mai tok) as well. I started off our meal with a bowl of thin rice noodles (kuay teow reua moo sen mee ก๋วยเตี๋ยวเรือหมูเส้นหมี่) and medium rice noodles with pork (kuay teow reua moo sen lek ก๋วยเตี๋ยวเรือหมูเส้นเล็ก). What I really loved immediately about the boat noodles at Kuay Teow Nai Buem (ร้านก๋วยเตี๋ยวนายเบิ้ม) is that they were nearly perfectly seasoned from the start. 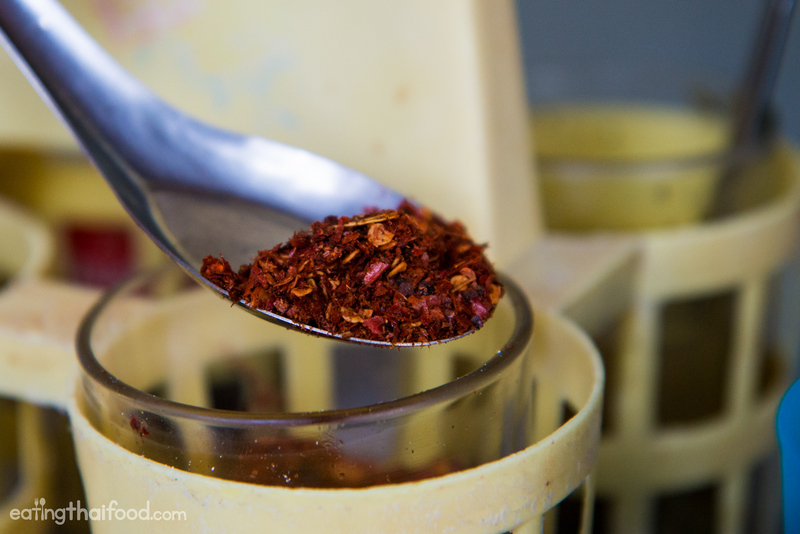 While normally I would need to add about 3 spoons of vinegar and 3 spoons of chili to every bowl to get the flavor right for my taste buds, the flavor they served was already quite sour and even quite spicy, without being sweet. The boat noodles were already nearly exactly the way I would season them myself. I did add just a touch of chili flakes extra because I’m a bit crazy for chili, but really for my wife (who eats spicy but not quite as much as I do) liked the taste of the soup without adding any condiments. Eating Thai boat noodles (ก๋วยเตี๋ยวเรือ) is a bit different from other types of soup noodles because it’s not really a soupy kind of noodle, but the soup is more like a gravy than a broth. In a good bowl of boat noodles the soup should be rich from the curdled pork blood, and coat the noodles without being watery. 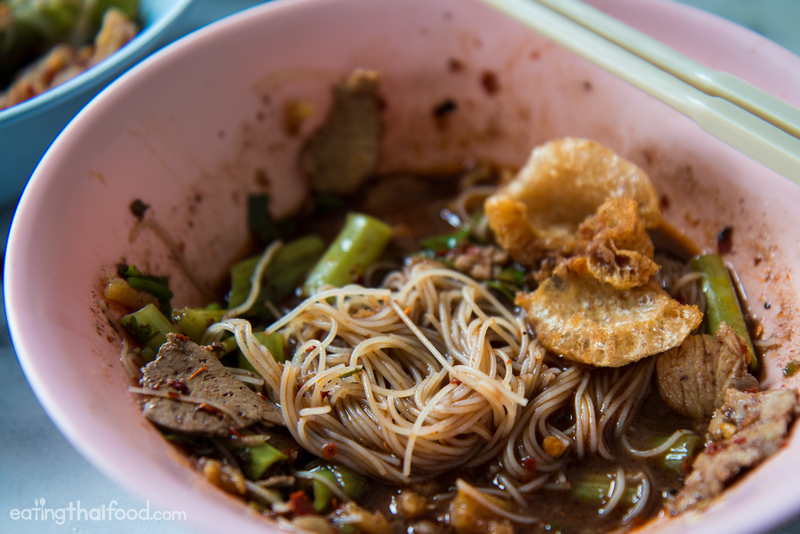 Another delicious component of eating Thai boat noodles is cab moo, deep fried pork skin. Breaking up a few pieces of fried pork skin and sprinkling them on top of your noodles is another delicious addition, and provides an extra crunch of texture as well. Finally, along with the more common rice noodles, I decided to try a bowl of kuay teow neua sen ba mee (ก๋วยเตี๋ยวเรือเนื้อเส้นบะหมี่), boat noodles with egg noodles, and I ordered the beef version. The soup was exactly the same, with a beautiful flavor, but instead of rice noodles, the smooth silky egg noodles were included. It was a good choice, and almost tasted like boat noodle strogonoff. Good stuff. Again, look at the color of that broth! I just wanted to show you one more photo of my bowl of noodles halfway through eating it to show you just how delicious and how flavorful that soup was. Look at the color and the richness of that dark soup! 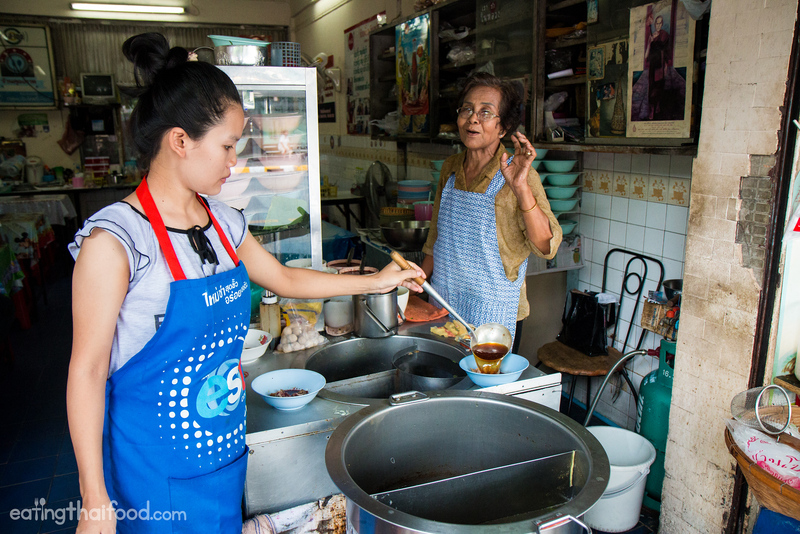 There are hundreds, maybe thousands of little boat noodle restaurants scattered throughout the Bangkok area. Far different from the atmosphere of Boat Noodle Alley, Kuay Teow Nai Buem (ร้านก๋วยเตี๋ยวนายเบิ้ม) is a small family style Thai boat noodle restaurant that’s been in business for over 40 years and serves simple, yet flavorful bowls of boat noodles. 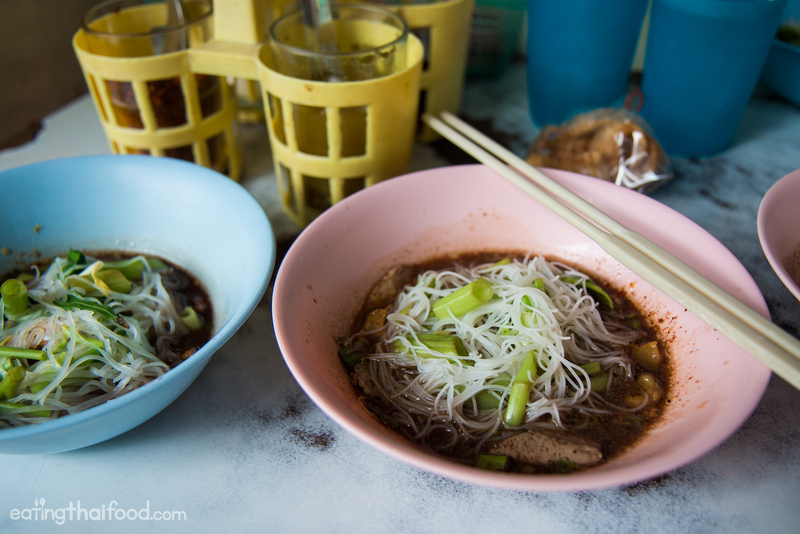 What I loved most about the boat noodles here is that they were nearly perfectly seasoned with spice and flavor right as they are served. 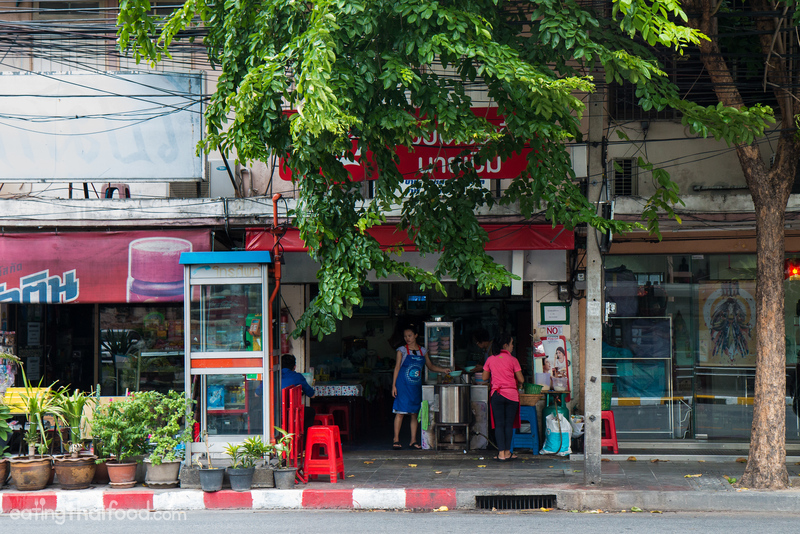 Prices: Noodles are 20 THB per bowl. They are not as small as some boat noodle restaurants, but not a full sized bowl either. One person can probably eat 3 – 5 bowls or more if you’re hungry. 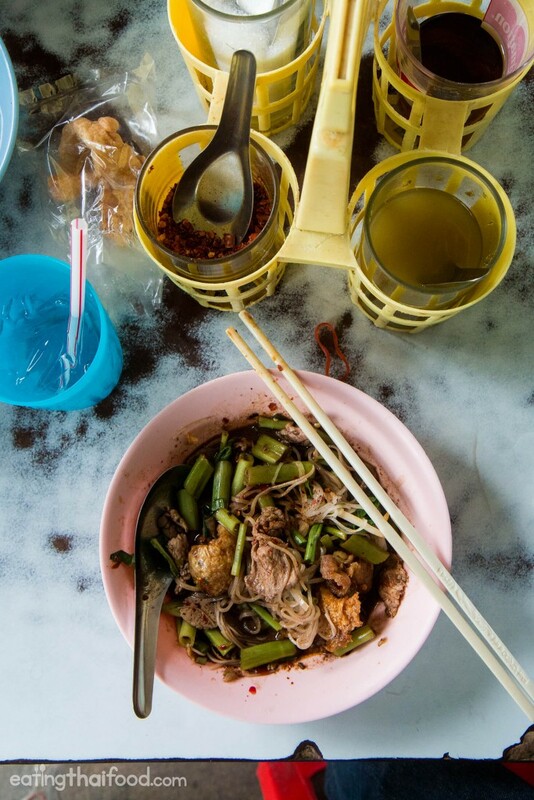 How to get there: Kuay Teow Nai Buem (ร้านก๋วยเตี๋ยวนายเบิ้ม) is located right along Samsen road in Bangkok’s Dusit area, not far from many of the government buildings and on the back side of Suan Sunandha Rajabhat University. It’s not really close to any BTS or MRT station, so best to either get there by bus or taxi. เปิดบริการทุกวัน 6.00 – 17.00 น.
I love boat noodles. I wish I could eat it everyday. In fact whenever I go back to Thailand I’d eat it EVERYDAY. But I live in Singapore and boat noodle’s not the kind of Thai food non-Thais like. So the only place it’s available here is Golden Mile. and it’s about SGD$3-5 each. It’s average food court-hawker centre meal price here but when I’m used to boat noodle being Thailand price it feels like such a rip-off. 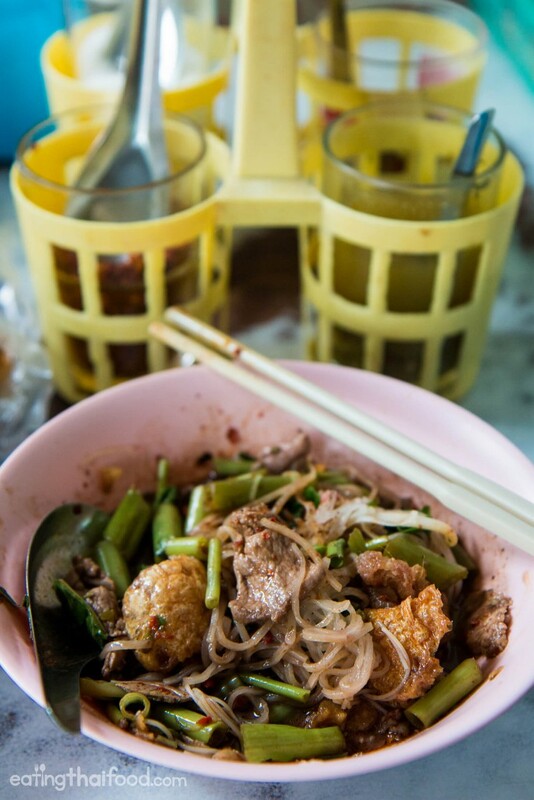 Hey Kay, great to hear from you, glad you love Thai boat noodles as well! Would you please post the recipe for the same, looks yum!! Hi Sakshi, good to hear from you. I’ve never made boat noodles yet, but I’d love to, as soon as I figure out the recipe I’ll try to post one.